Sharing a couple more outfits from the Sindy lot I acquired... Whoever previously owned the stuff really liked their sleepwear. There was another Sweet Dreams outfit in the lot that was white with a floral pattern but that nightgown's straps were completely missing and the elastic on the fabric was too loose to hold the dress up. Sadly, none of my dolls can model it. 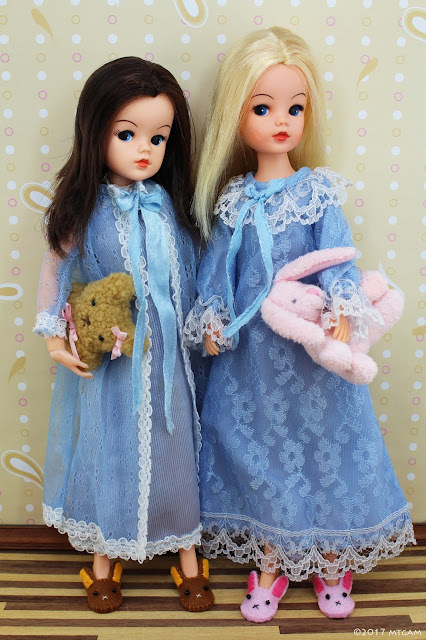 As it is, the Misty Blue nightgown on my brunette Sindy has misaligned straps. It looked like someone had tried to mend it in the past and forgot to measure. Luckily, there is a negligee jacket that covers it all. The blue Sweet Dreams nightgown is in pretty good condition except for the worn out bow. Sindy dolls sure liked wearing outfits with a lot of lace. 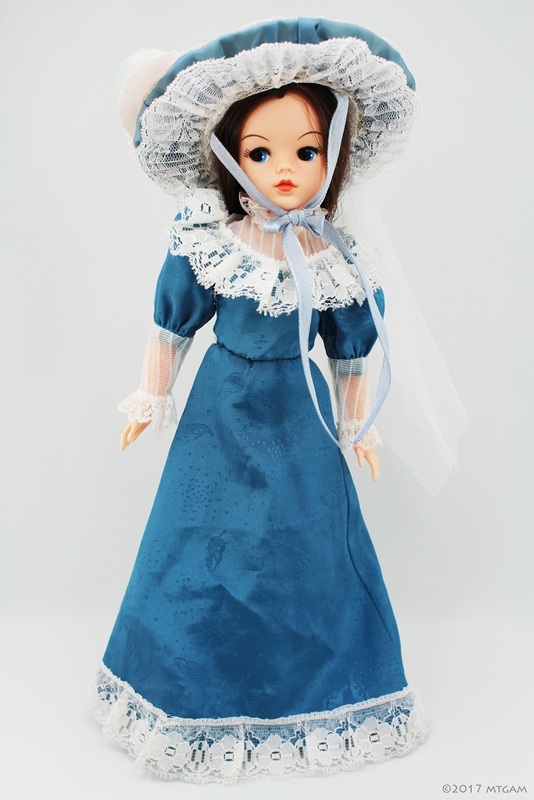 In the mean time, here's my newly named Sindy doll, Florien, modelling the My Fair Sindy dress. The dress could use some ironing. It was also missing the matching hat so I had to improvise and borrow from another doll. Looks pretty good despite the slight color variation. I love it when things work out! What cute bunny slippers your girls have! I'm not a Sindy expert - only have 3 Pedigree Sindy family dolls - but there is a Wiki post about identifying Sindy dolls that might help. Or Petra's site or the Sindy Museum might answer your wondering about your Sindys. The sites don't seem to be active now, but the information they provide is worth a visit. If you have more current information about Pedigree Sindys, please share here. Good luck with your queries and collecting.